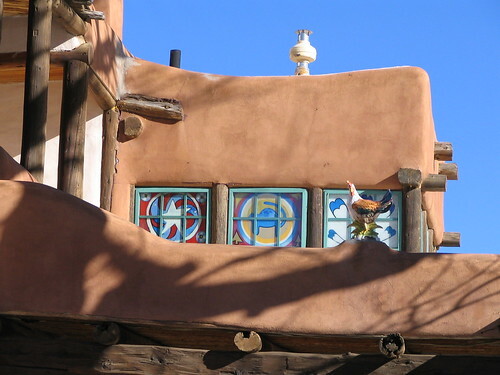 –Mabel’s Place, Lawrence windows, Mabel Dodge Luhan House, Taos, New Mexico, February 2007, photo © 2007 by QuoinMonkey. All rights reserved. A friend of mine told me she’s been rereading her old writing practice notebooks. She said it took her splat into the face of Monkey Mind; she also discovered a few gems. Inspired, I started reading over notebooks from an Intensive writing retreat in Taos last year. It’s hard to reread the dribble and drat of writing practice. I’m glad I remembered my wading boots. It was getting pretty thick in there. I found passions and complaints, all the frustration and fear, the rawness of sitting in silence. There was a whole paragraph on an ant crawling through a patch of light and into a crack in a floor plank. Another two on breathing in and out, the workers talking in the distance, the wind through the small corner window hitting the side of my face. The same things kept popping up over and over again. But once in a while, there it was – a refreshing moment of clarity. The continuation of writing through all your discursive thoughts is the practice. A month later you recognize consciously the good writing when you reread your notebooks. At this point our unconscious and conscious selves meet, recognize each other, and become whole. This is art. In the pages of that old notebook, I discovered a 10 minute practice from February of 2007, one of the last practices we did as a group in the zendo. The topic was to make a list of what we remembered about the last year of writing in the Intensive. There was a strong feeling of intimacy, and of something ending. And at the same time, a fresh start. Details. Write details. They bring the work alive. Stand on the backs of the writers that came before you. Read everything by an author. Be grateful for writing connections. Give back to your community. Don’t just take. Have compassion for other writers. Study their lives. Study good literature, essays, and word counts. Ask questions. Listen for the answers. The more personal it is, the more others can relate to it. Love good books. Love other writers. Go where they lived and worked. Insights aren’t always followed. Sometimes they go back inside. Seeds from a Birch Tree, James Baldwin, John Cheever. Sugar Nymphs, Caffe Tazza, Ghost Ranch, the Harwood. Keep writing practice at my back. Do not waste this precious life. Study the minds of other writers. Practice and sitting teaches how to hold creative energy. The energy of resistance turned is awakening. What a thoughtful list. Thanks for the jumpstart…I have been thinking of re-reading “Writing Down the Bones,” as it’s probably been five years or so. I think I will start today. What a great list. Thank-you for writing it, for the reminders. Today was the first day (oddly enough) that I felt deeply changed by that year in the zendo. I went with a group to Fort Snelling on the Mississippi River for their 4th of July Celebration. We followed that by lunch at Sea Salt, the restaurant that overlooks Minnehaha Falls. It was an outing that took 7 hours start to finish. Everywhere we went there were lots of people, and lots of noise. Absolutely everyone in my group had additional plans for the evening, plans that would consume the rest of their day. At the same time as I didn’t want to appear the dud for not having my evening filled, I thought, “Why is everyone so busy? Why is there so much talking?” And I found myself longing for silence, to be still, to sit and just look at the river. I had my notebook in my bag, and had an intense desire to do a writing practice at the point where the Minnesota and Mississippi Rivers converge. I resisted. I’m not necessarily comfortable with what I see in myself. I don’t want to feel abnormal. Yet at the same time, when I see an evening stretching before me of reading and silence, I would choose nothing else. I look at this picture of Mabel Dodge, and I hope I am not alone in this experience, that there are several heads nodding in understanding. Teri, I can picture all the places where you spent the day: Fort Snelling, the Mississippi, the Minnesota, Minnehaha Falls, Sea Salt. All I can think about is sitting in those places and staring at the rivers or the falls. And then taking out my notebook and writing. Reading and silence – I’m nodding. I would choose nothing else. I spent the day at home, writing, reading, firing up the BBQ and watching a thunderstorm roll through as the wind whipped and we quickly gathered the last of the coals together to melt our marshmallows for s’mores. A few firecrackers went off over at the Garden Lady’s house (she gave us a new geranium to transplant a few days ago), but other than that, nothing fancy. Tonight I am going to read a good book. And sleep well. I’m glad I’m in good company. elizabeth, let us know how it goes with Bones. I get something new out of it every time I read it. I’ve read the description of your day about 4 times. A day at home doing simple things like making s’mores and watching storm clouds sounds like a dream. On holidays like this, I begin to think I’m the only one who isn’t wearing a lampshade on her head and saying, “Party, baby!” What are you reading? I’ve got a 1927 copy of The Bridge of San Luis Rey (Thornton Wilder) in my hands. The pages are extremely thick, almost like turning thin pieces of cardboard. Teri, a mixed bag of reading this weekend. I reread some parts of When The Emperor Was Divine by Julie Otsuka. And now am on Things Fall Apart by Chinua Achebe. Really good reading. Yesterday some books came in the mail that Liz had ordered for a class she is taking, History & Systems of Psychology. Most of the books were by William James, the father of psychology and a prolific writer. He just happens to be the brother of Henry James, the writer. And one of the books had letters from William to Henry from the 1800’s. I just found them fascinating. I wonder if blogging will be the future place people will be spelunking for letters between writers? Who knows. I know what you mean about old books – I drool over them. The 1927 copy by Wilder sounds delicious to read. One of the William James books was part of an old library set from 1890! They were the first set of books used to teach psychology and lasted for the following three decades. They even had the library cards in the back with the names of the people that checked them out all through the early 1900’s. Fascinating stuff. Have you ever been to that coffee shop over in Northeast named for Thornton Wilder, Wilderoast Cafe? Great place to write. Wasn’t he born in Madison, Wisconsin? Hi from Ghost Ranch, QM. This is a lovely list to read as I’m off to work in the studio again, to wrap up my painting for today. Painting is a lot like writing. No judgment, just paint. I am especially grateful for the last one: the energy of resistance turned into awakening. I had a lot of resistance to my first painting. It seemed too simple. And then it was done and I realized it was this whole different direction for me. Different yet rooted in everything I know about painting. Then I started this morning on my second piece, and same thing. Too simplistic, not enough movement or action. Yet I kept going. Thank you, too, for giving the blog extra energy while I’m here. I haven’t been to Wilderoast in Northeast. All along, I thought it was a coffee shop named for Oscar Wilde. I guess I had the wrong author. Yes, Thornton Wilder was from Wisconsin. You’ll also be interested in hearing he was friends with Willa Cather. Our people were all moving together back there! I’m picturing you in that open-air building at Ghost Ranch (is it circular?). I’m glad to think of you there in the peace. No fireworks, I’ll bet. Teri, oh dear, alas you are correct! It is I who have the wrong author! It’s definitely Oscar Wilde at Wilderoast. Boy was I off. Thanks for the nod. I did not know Wilder was friends with Willa Cather. Small world for the writers of the Midwest. ybonesy, good to hear about the energy of your painting at Ghost Ranch. So much why you are there. I can picture the land, the sky, the buildings. A good place to paint. No problem holding things down on this end. Keep going. I’m off to work in the studio again, to wrap up my painting for today. Painting is a lot like writing. No judgment, just paint. If you’re a painter, you go to your studio every day, you set out your colors on your pallet, you put down a mark on the canvas, then another, then another, you stand back, you add, you take away. It’s the same thing with writing. You get up every day and you sit down at your desk and you put down a word, or a sentence, or, on a good day (I work very slowly) maybe a half page. You add a word here, you take one away, you sketch out a scene, it’s all wrong, it needs to be a little warmer, a little cooler, you change it, it’s still wrong… It’s just not that different from painting, really, the process of writing.